Most of us are aware of the fact that Omega-3 essential fatty acids offer a number of health benefits. 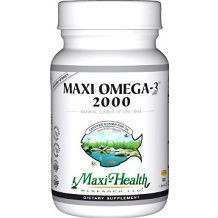 The Omega 3 Max essential fatty acids supplement offers the benefits of maximum absorption and as with other Omega-3 supplements, it promises no fish aftertaste. The other health benefits which are offered by Omega-3 Max, apart from improving one’s immune system is that the fatty acids allow for improved cardiovascular health, lowered cholesterol and healthy blood pressure levels. EPA- 720mg. EPA is known for its ability to treat the symptoms of menopause along with bipolar disorder and depression, if the dosage is correct. DHA- 480mg. DHA which has been shown to greatly reduce the symptoms associated with ADHD, as well as depression. In addition, the claim is that DHA has been proven to increase mental performance. EPA and DHA are the same omega-3 fatty acids which are present in fatty fishes, such as cod, mackerel, salmon, herring, anchovy and swordfish. The directions for Omega-3 Max is two capsules taken twice per day, with food. As with all Omega-3 supplements, it is recommended that the individual discuss the benefits and side effects before they take the supplements. 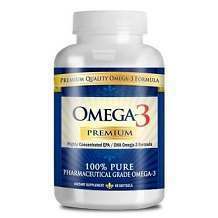 When purchasing the Omega-3 Max via the online website, the cost is $45.95. However, should buyers wish to purchase more than one bottle, the cost per bottle is less. For instance, if three bottles are purchased, the price per bottle is then $41.36. Even with the discount for bulk purchases, the price is a lot higher when compared to Omega-3 premium. The offer which is offered to those who wish to buy in bulk is that a 10% discount will be applied when purchasing more than three or more bottles. Omega 3 Max does offer a 100% money back guarantee. The guarantee states that should the buyer not be 100% satisfied with the purchase, a full money back refund is offered. Although this guarantee exists, there seems to be little information available on how one would apply for the refund. Apart from the money back guarantee, the manufacturers also offer a guarantee that the Omega-3 Max is free from harmful contaminants and that all products sold by the vendor are guaranteed to meet the claims which are made on their labels. While Omega 3 Max is a supplement which contains quality ingredients, it is not wise to see it as a viable alternative to other similar products on the market. This product is not FDA inspected, which is a vital quality for any product to have to ensure confidence to the consumer that it was made in the highest of standards and ingredients.